In this document, “we”, “our”, “us” or “The Crafty Lass” refers to Paula Milner T/A The Crafty Lass®. Paula Milner T/A The Crafty Lass® is registered with the ICO (Information Commissioner’s Office) under registration number ZA291431. We do update this policy from time to time so please refer back to this document on our website if and when required for the latest version. 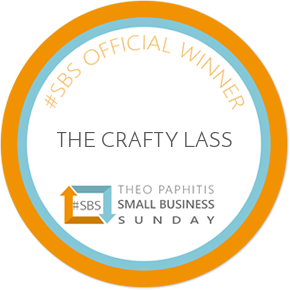 We collect certain information or data about you when you use www.thecraftylass.com and are committed to safeguarding your personal data. This document advises what data we do collect, how we use it and how we store it. If you contact us via email, telephone or via our ‘Contact Form’ via The Crafty Lass® CONTACT website page we will receive the relevant contact data you provide. These details are required to communicate effectively with you whilst we respond to your enquiry. Your contact details will not be used for marketing purposes. We will not share your information with any other organisations for marketing, market research or commercial purposes, and we will not pass on your details to other websites. If you purchase a product from The Crafty Lass® or book on to a The Crafty Lass® workshop – we receive the relevant contact data you provide. These details are required to communicate effectively with you in regards to your purchase or booking. Your contact details will not be used for marketing purposes. We will not share your information with any other organisations for marketing, market research or commercial purposes, and we will not pass on your details to other websites. Any comments you make via The Crafty Lass® social media channels, or comments made in response to blog posts on The Crafty Lass® blog is data that has been freely given to us by yourself. Please let us know if you require us to remove your comment(s). If you have contacted us in regards to a general or business enquiry, workshop, purchase or party booking – we will use your details to respond to your contact effectively. As stated above, your contact details will not be used for marketing purposes. We will not share your information with any other organisations for marketing, market research or commercial purposes, and we will not pass on your details to other websites. If you are a supplier, journalist or other business contact we may hold your data and contact you in regards to legitimate business enquiries. Your contact details will not be used for marketing purposes. We will not share your information with any other organisations for marketing, market research or commercial purposes, and we will not pass on your details to other websites. Our marketing emails and campaigns are managed by the external email marketing platform, MailChimp. If you attend a The Crafty Lass® workshop, as part of the workshop welcome and introduction, we will ask you whether you would like to join our marketing database to receive information via email of future workshops, events and The Crafty Lass® news. We would require your name and email address for this. If your answer to this is ‘NO’ – no further action will be taken. If your answer to this is ‘YES’ we will ask you to complete a form with the required data and this will then be added to the The Crafty Lass® marketing database and you will start to receive emails in regards to future workshops, events and The Crafty Lass® news. When your name and email address are added to the database you will be informed by MailChimp of this and be provided with a double ‘opt-in’ option. Please ensure to respond to this to ensure you are added to our database should you wish for this to happen. Every email sent to you via this platform also provides the option to ‘Unsubscribe’ at any point. You may also contact us at The Crafty Lass® and we can remove you from the database at any point should you wish. All data processing undertaken by The Crafty Lass® is carried out on a lawful basis as per the General Data Protection Regulation, Article 6(1). All payments via The Crafty Lass® website are managed and processed by the secure online ticketing facility Eventbrite. We do not receive any information in regards to your payment details. Payments taken onsite at The Crafty Lass® Old Grain Store workshop studio are either by cash, or via the PayPal app ‘PayPal Here’ money dashboard. We do not receive any information in regards to your payment details. We avoid the storage of sensitive data where possible. There are occasions where we come into contact with significant dates in relation to birthdays and/or events. Where possible we will remove this from our records. The Crafty Lass® website is hosted by a UK hosting server who comply with GDPR regulations. We have a number of security measures and features that are implemented to try and ensure the safety of any information in our possession or control, once we receive it. Transmitting information over the internet is generally not completely secure, and we cannot guarantee the security of your data. Any data you transmit to us is at your own risk. By submitting your personal data, you agree to this. We will review if we require our data on an annual basis. You can find out what information we hold about you and ask us not to use any of the information we collect. All enquiries should be made in writing to: Paula Milner, The Crafty Lass, The Old Bakehouse, Owl End Lane, Lower Boddington, Northamptonshire, NN11 6XZ. Should you have a complaint to make in regards to how The Crafty Lass® uses your data, please ensure to contact us to discuss this. In line with GDPR Article 6(1)(c) we may pass on your personal information and exchange any of your details if we have a legal obligation to do so.